The physical properties of polymer strongly depend on the length (or equivalently, the molecular weight) of the polymer chain. One important example of the physical consequences of the molecular weight is the scaling of the viscosity (resistance to flow) in the melt. The influence of the weight-average molecular weight (Mw) on the melt viscosity (η) depends on whether the polymer is above or below the onset of entanglements. Below the entanglement molecular weight[clarification needed], , whereas above the entanglement molecular weight, . In the latter case, increasing the polymer chain length 10-fold would increase the viscosity over 1000 times. [page needed] Increasing chain length furthermore tends to decrease chain mobility, increase strength and toughness, and increase the glass transition temperature (Tg). 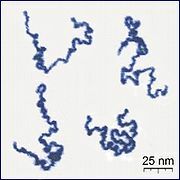 This is a result of the increase in chain interactions such as Van der Waals attractions and entanglements that come with increased chain length. These interactions tend to fix the individual chains more strongly in position and resist deformations and matrix breakup, both at higher stresses and higher temperatures.